Strawberries are an excellent source of Vitamin C but since humans cannot produce their own Vitamin C (as many other mammals) we have to get our daily dose. One serving of strawberries contains 51.5 mg of vitamin C - about half of your daily requirement. Two servings becomes one cup and that covers 100 per cent. Vitamin C boosts your immune system and is a fast-working antioxidant. A UCLA study finds that the antioxidant power in strawberries becomes “bioavailable” or “ready to work in the blood” after eating the fruit for just a few weeks. High doses of fresh strawberries or Vitamin C are said to maybe prevent cataracts in women over 65. Cataracts lead to blindness. Our eyes need Vitamin C to protect from exposure to free-radicals from harsh UV rays, which can damage the protein in the lens. Vitamin C also helps strengthen corneas and retinas. Vitamin C is vital to the production of collagen, which helps to improve skin’s elasticity. Eating Vitamin C may result in healthier younger looking skin. Ellagic acid visibly prevents collagen destruction and inflammatory response. Those are two major factors in developing wrinkles after continued exposure to UV-B rays. Strawberries contain powerful heart-health boosters. Ellagic acid and flavonoids or phytochemicals can provide an antioxidant effect that can benefit heart health in various ways. One way includes counteracting the effect of low-density lipoprotein, or LDL which is bad cholesterol in the blood, which causes plaque to build up in arteries. A second way is that they provide an anti-inflammatory effect, which is also good for the heart. Adding strawberries to your diet reduced oxidative damage, as well as blood lipids - both of which play a role in heart disease and diabetes. Strawberries antioxidants and phytochemicals may help reduce inflammation in your joints. Women who eat 16 or more strawberries per week are 14 percent less likely to have elevated levels of C-Reactive Protein (CRP) - the indicator of inflammation in the body. Strawberries have 134 mg per serving of potassium and potassium can help regulate blood pressure and may even help to lower high blood pressure by acting as a buffer against the negative effects of sodium. As they reduce LDL, inflammation and high blood pressure, strawberries are considered one of the most heart-healthy fruits out there today. Fiber is needed for healthy digestion and strawberries naturally contain about 2 g per serving. Fiber is needed to fight constipation and diverticulitis, the inflammation of the intestines, which affects approximately 50 percent of people over 60. It can also aid in fighting Type 2 diabetes. Fiber helps slow the absorption of sugars (i.e. glucose) in the blood so those who are managing diabetes should eat strawberries but in moderation. 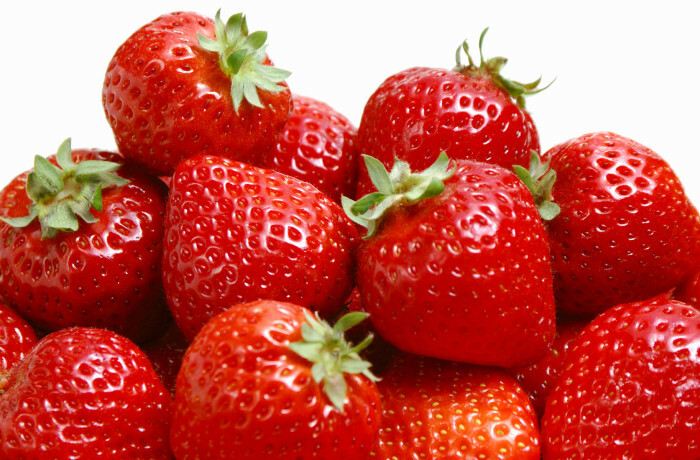 Strawberries are naturally low calorie with about 28 calories per serving. They are fat-free and low in sodium and also low in sugar. Yes, strawberries do contain natural sugars, though total sugars are quite low with 4 grams per serving. The total carbohydrate content is equivalent to less than a half slice of bread. Eat an entire 1.5 cups and you have a snack less than 100 calories.